Principal river of Palestine, formed by the confluence of three streams rising respectively at (1) Baniyas (Paneas), (2) Tell al-Ḳaḍi (Dan), and (3) Ḥaṣbeyah (Baal Gad) at the foot of Mt. Hermon. The Jordan flows south through the Baḥr al-Ḥulah (Lake Merom) and Baḥr al-Ṭabariyyah (Lake of Tiberias or Gennesaret) and empties into the Dead Sea at its northernmost point, 137 miles in a straight line from the river's source. The Jordan's course is so winding that between Tiberias and the Dead Sea, a direct distance of 65 miles, it measures 200. At Tiberias the water isclear, but farther down it becomes yellow. The stream is very rapid, for it has a fall of 3,000 feet from its source to its mouth. The Jordan valley (in Arabic "Al-Ghor") is geologically remarkable as compared with the remainder of Palestine. The lower portion lies far below the level of the sea, and it is furthermore lined on both sides by cliffs which rise precipitously above it in abrupt terraces and shut it off from all breezes. Its climate is therefore tropical, the temperature being rarely below 77° and sometimes as high as 130°. In flora and fauna it is to a corresponding degree distinct: plants characteristic of Nubia, Abyssinia, and the Sahara grow in rank luxuriance; fishes proper to Lake Tanganyika are found in the Sea of Galilee; and birds which belong naturally in Ceylon and India are seen throughout the valley. Except in Ps. xlii. 7 (A. V. 6) and Job xl. 23, "Jordan" occurs with the definite article, its meaning being "the descender." The Jordan is pointed out as the source of fertility to a large plain ("Kikkar ha-Yarden"), called on account of its luxuriant vegetation "the garden of God" (Gen. xiii. 10). There is no regular description of the Jordan in the Bible; only scattered and indefinite references to it are given. Jacob crossed it and its tributary, the Jabbok (the modern Al-Zarḳa), in order to reach Haran (Gen. xxxii. 11, 23-24). It is particularly noted as the line of demarcation between the "two tribes and the half tribe" settled to the east (Num. xxxiv. 15) and the "nine tribes and the half tribe of Manasseh" that, led by Joshua, settled to the west (Josh. xiii. 7, passim). The sources of the Jordan are not mentioned; and only in the short description of the eastern boundary of the latter tribes (Num. xxxiv. 10-12) is the Jordan mentioned in connection with Chinnereth (Gennesaret) and the Dead Sea, the latter being the southern end of the boundary-line. Opposite Jericho it was called "the Jordan of Jericho" (Num. xxxiv. 15, xxxv. 1, passim). The Jordan in general is very deep (comp. I Macc. ix. 48), but it has a number of fords, and one of them is famous as the place where 42,000 Ephraimites were slain by Jephthah (Judges xii. 5-6). It seems that these are the same fords mentioned as being near Beth-barah, where Gideon lay in wait for the Midianites (Judges vii. 24). In the plain of the Jordan, between Succoth and Zarthan, is the clay ground where Solomon had his brass-foundries (I Kings vii. 46). In Biblical history the Jordan appears as the scene of several miracles, the first taking place when the Jordan, near Jericho, was crossed by the Israelites under Joshua (Josh. iii. 15-17). Later the two tribes and the half tribe that settled east of the Jordan built a large altar on its banks as "a witness" between them and the other tribes (Josh. xxii. 10, 26 et seq.). The Jordan was crossed dry-shod by Elijah and Elisha, each of whom divided the waters with a stroke of the mantle (II Kings ii. 8, 14). Elisha performed two other miracles at the Jordan: he healed Naaman by having him bathe seven times in its waters, and he made the ax of one of the children of the prophets float by throwing a piece of wood into the water (II Kings v. 14, vi. 6). The Jordan was crossed by Judas Maccabeus and his brother Jonathan during their war with the Nabatæans (I Macc. v. 24). A little later the Jordan was the scene of the battle between Jonathan and Bacchides, in which the latter was defeated (I Macc. ix. 42-49). According to the Talmud is a compound, ( = "which descended from Dan"), and the river was called thus because it takes its source in the grotto of Paneas, in the city of Dan (the Biblical Leshem; Bek. 55a; comp. 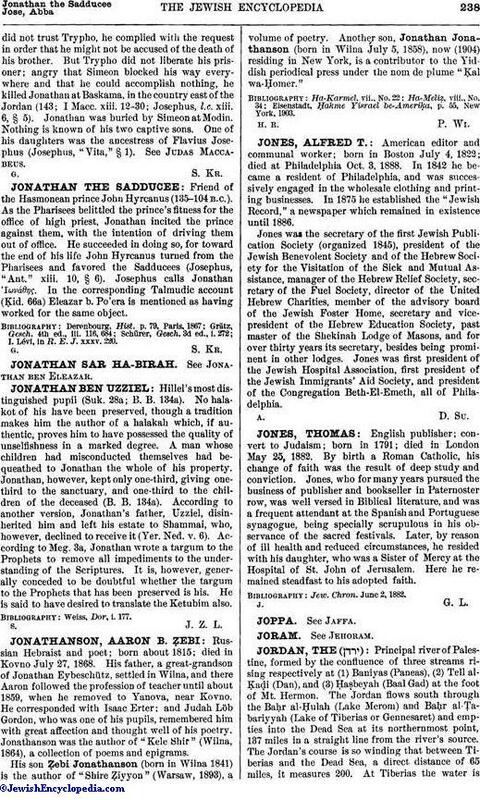 Josephus, "B. J." iii. 10, § 7). The Jordan is one day's march from Jerusalem (Ma'as. Sh. v. 2). It traverses lakes Samko (Samachonitis) and Tiberias, the Dead Sea, falls into the Mediterranean, and there flows into the mouth of Leviathan (Bek. 53a; B. B. 74b). However, by a miracle, the water of the Jordan, the use of which in the Temple was prohibited on account of its impurity (Parah viii. 9), does not mingle with the waters of the Lake of Tiberias (Gen. R. iv.). 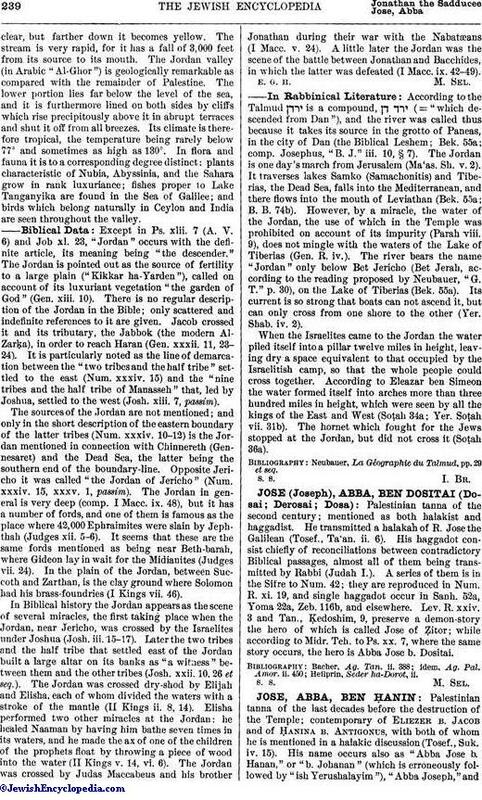 The river bears the name "Jordan" only below Bet Jericho (Bet Jerah, according to the reading proposed by Neubauer, "G. T." p. 30), on the Lake of Tiberias (Bek. 55a). Its current is so strong that boats can not ascend it, but can only cross from one shore to the other (Yer. Shab. iv. 2). When the Israelites came to the Jordan the water piled itself into a pillar twelve miles in height, leaving dry a space equivalent to that occupied by the Israelitish camp, so that the whole people could cross together. According to Eleazar ben Simeon the water formed itself into arches more than three hundred miles in height, which were seen by all the kings of the East and West (Soṭah 34a; Yer. Soṭah vii. 31b). The hornet which fought for the Jews stopped at the Jordan, but did not cross it (Soṭah 36a). Neubauer, La Géographie du Talmud, pp. 29 et seq.